Winter break is here – hooray! Schools are out and even college students will be home for a few weeks. We are sure you’ll be busy with parties and presents but its not too soon to be thinking about summer! Sure, this fall you researched camps for your younger kids and probably even dropped a few hints that the older (college) ones could really get a lot out of a summer job at camp. But have you considered a real FAMILY summer at camp? CampStaff is our year round job but summer camp itself is what we live for. Each summer, Lynn and our three daughters head up to the White Mountains for a full summer at camp. Lynn is a Junior Camp Area Director responsible for around 70 kids at a time and 30 or so staff. From home, Bunkie keeps CampStaff operating and runs our camp consulting business. He spends about 10 days at camp each summer, trading-off whatever odd jobs a former camp director is capable of handling for unlimited chicken patty sandwiches and all you can drink camp coffee. In all seriousness, camp is a huge part of our child rearing plan. We live in a rural community and enjoy the many benefits of that lifestyle. The camp we choose for our kids, exposes them to campers from the major cities and suburbs of the northeast and with staff from around the globe. Our kids have had playdates on Park Avenue, have taken camp friends to harvest sugar cane and had high tea with counselors in London, among hundreds of other experiences. Camp has really opened up amazing opportunities for our family. The individual and family success we’ve had at camp did not happen by chance. We carefully selected the right camp for our family before committing to work there. We knew we wanted a beautiful New England location, with a strong outdoor program and “nice” kids – luckily the camp we started at before becoming camp professionals, fit the bill and was in need of senior staff. When choosing a camp for your family, be sure the summer camp meets all your criteria up front. There are hundreds of options out there, there is no reason to try to shoe horn yourself into a not perfect fit. 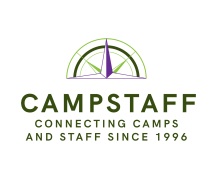 CampStaff or other summer camp job sites can help you match your needs with those of summer camps. We mentioned the camp we choose was one we had a history with so we knew the directors well and still had relationships with former campers and staff. For you choosing a camp from scratch, start with the camps website. Does it convey the values you are looking for? Next check out the camp’s social media feeds. (You can find the links on the camp’s website.) See what the camp chooses to share and what type of comments campers, parents and alumni leave. If you want to really stalk the camp (our kids’ term! ), check out who follows the camp and what they post. You can get a strong sense of a camp’s values by seeing their community. Reach out to the directors personally. Assuming the camp has listed a job opening in your skill set (like on CampStaff.com), set up a personal call with the directors. The directors may actually appreciate this since a huge part of their job is making sure campers are good fit with their camp. Taking the initiative shows you understand a great camp is more than random luck. Ask all the questions you would ask if you were paying to send you kids to camp and would not be there all summer. The biggest challenge for a staff member with kids at camp is allowing the separation that makes camp work so greta for kids. A great camp will walk you through this process and have guidelines in place to help you deal with the separation (aka camp sickness). A few tips we’ve picked up; even if your whole family is at camp, everyone still likes getting mail and mail call. Write letters, even if you see each other a few minutes every day. Schedule phone calls with someone. Campers love phone call times and depending on the camp’s policies, it may even be a scheduled activity. Make sure your kid has someone to call – grandparents love to fill this role! Visiting day can be challenging because as staff, you will have responsibilities. Again, a grandparent visit might fit the bill. Or ask the camp (again the best camps will have a plan already) to block out a little time for you and your kids. The best part of our family participating in camp together is shared experiences and shared friendships. We love sharing social media posts from camp people who we all know. When we travel, camp always has a connection either from someone in that area or a camp story. Camp really can be a huge part of your life if you want it to be!